Hello everybody, it’s YQ writing from Singapore. Yes, I am back in the land I am most familiar with. Yes, I’m more familiar with Singapore than my hometown Kota Kinabalu. It’s been more than a week since I came back and I am now in full job hunting mode. I’ll update you guys on my job search if I have any happy news. Oh, if you know anyone in Singapore hiring writers, do drop me a mail at hello@yqtravelling.com. Hawker centers and food courts: In Sabah, it’s actually very awkward for a single lady to eat at a kopitiam. However, it’s the norm here in Singapore and I love it very much. Safety: I was walking in the middle of Singapore’s city center on Sunday night after 9:30pm. I realized that this is the only place which I could walk alone safely so late into the night. Convenient public transport: Singapore’s public transport is really developed and it’s quite cheap to travel within the country. Awesome libraries: The collection of books at Singapore’s library is so amazing that I haven’t touched my Kindle for several days. Friends: The best part about coming back to Singapore is meeting old friends. 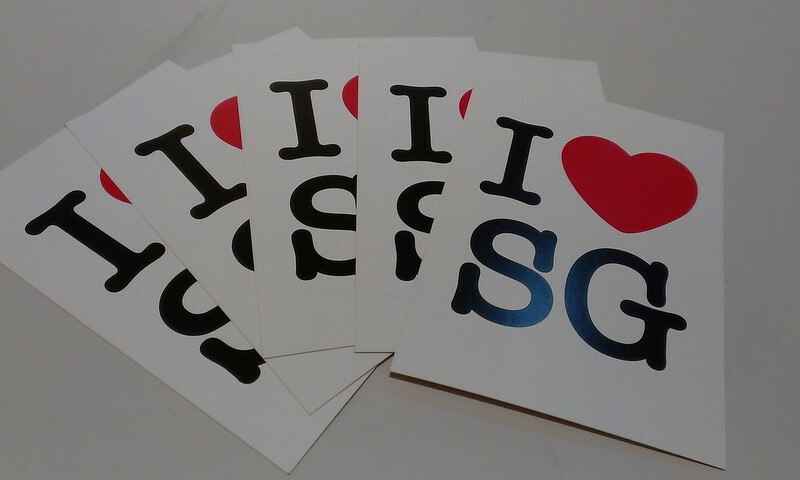 To celebrate my return to Singapore, I am giving away postcards to 5 readers/Facebook followers of YQtravelling.com. Giveaway closes on November 18, 2013, GMT+8 23:59. Afterwards, I’ll be selecting 5 random commenters to send each of them (that could be you!) a I <3 Singapore postcard from Singapore. If you are living in Singapore, don’t worry. I can also send the postcards to you here or to someone abroad on your behalf. What are you waiting for, head onto Facebook and leave a comment. PS Sorry to all others who do not have Facebook, I’ll come up with something for you in the future. I have ‘I .< that's a bad luck! I accidentally deleted the FB post. >.< Putting another one up right now. I know how you feeL about safety.. A few days ago I got Lost and had to waLk aLong Serangoon Road to Boon Keng station aLone, at midnight, and I feLt perfectLy safe. I couLdn’t imagine what wouLd happen to me if the same situation occurred in Jakarta.. Neither in Kota Kinabalu where I grew up. Thankful for Singapore’s safety.